Negative-stranded RNA linear genome, about 11 kb in size. Encodes for 5 proteins. Attachment of the viral G glycoproteins to host receptors mediates Clathrin-mediated endocytosis of the virus into the host cell. ETYMOLOGY Vesiculovirus: from latin Vesicula: “bladder, blister”, symptom induced by Vesicular stomatitis virus. 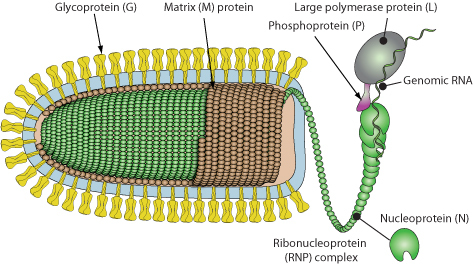 CELL RECEPTOR (S) Cell receptors:? ASSOCIATED DISEASES Vesicular diseases, encephalitis Flu-like symptoms in human. TRANSMISSION VSV: Zoonosis, arthropod bite.